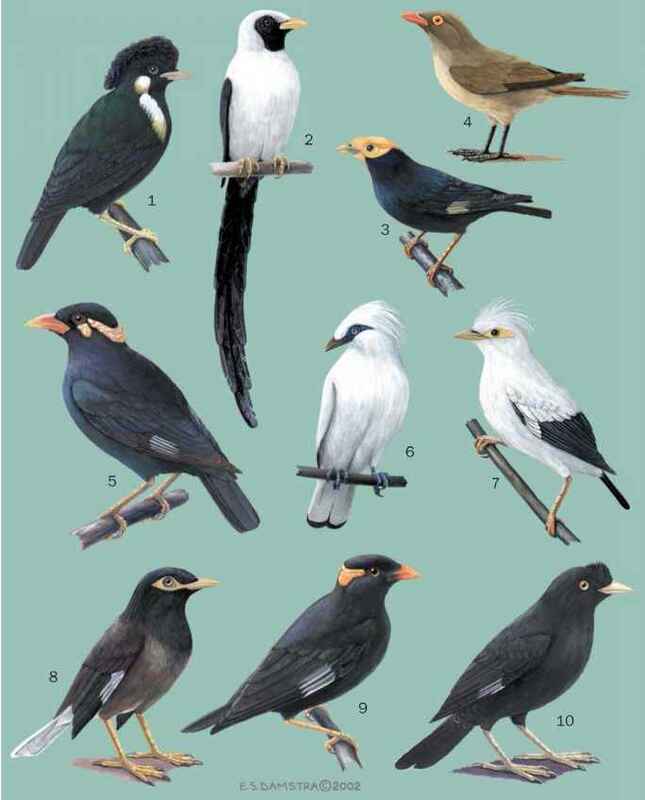 English: Goldfinch, wild canary; French: Chardonneret jaune; German: Goldzeisig; Spanish: Dominiquito Canario. The American goldfinch is about 4.3 in (11 cm) in body length and weighs 0.5 oz (14 g). The male is colored overall a bright canary yellow, with black wings marked with white bars, a black tail, and a black face cap. The female is a more subdued yellow, with dark wings and tail. The juveniles are olive-yellow, with darker wings. During the winter, the male is not so brightly colored. 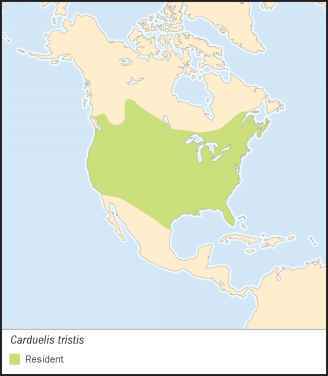 The American goldfinch breeds throughout much of southern Canada and the northern half of the United States. It winters in extreme southern Canada, through most of the United States, and northern Mexico. The American goldfinch breeds in open, mixed-species forests and shrubby places. It winters in shrubby habitats, old fields, and parks and gardens. American goldfinches have a distinctive, bounding flight. They are migratory birds, breeding in northern parts of their range and spending the winter wandering in the southern reaches. They are highly social birds, particularly during the non-breeding season when they may form large flocks, often with other finches. They often breed in loose colonies. Their courtship and territorial display includes acrobatic aerial maneuvers by the male, which also sings during flight. The song is a high-pitched twittering, and there are also distinctive call notes. American goldfinches feeds on small seeds and grains, particularly favoring plants in the aster family, including sunflower, lettuce, and thistles. American goldfinches arrive at the northern parts of their breeding range in April or May, about the time dandelions and some other early-flowering plants begin to set seed. However, the species does not breed until about mid-July. In more southerly locales, such as California, breeding can begin in March and continue through July and even, in exceptional cases, into November. Most pairs probably rear only one brood per year. The reasons for the relatively late-starting breeding of the American goldfinch is not understood, but it may be related to the timing of the maturation of the seeds of thistles, which are a major food for the young birds. The cup-shaped nest is woven of grasses and other plant fibers. It may be placed in a large thistle or other tall weed, or in a shrub or tree. The eggs are colored pale blue, and a typical clutch size is four to five eggs. Incubation is 12-12 days by the female. Both male and female feed the nestlings and fledging occurs in 11-17 days. Not threatened. The American goldfinch is a widespread and abundant species. There is evidence that its abundance has been decreasing during recent decades, but it is not yet considered to be a species at risk. The population decrease is likely due to habitat loss through urbanization and the intensification of agricultural practices, which result in fewer areas with weed-rich, shrubby habitat.